One of my big issues with farming sims is that they’re mostly played by people who have never ever spent any time working on a farm. Not that I think you have to be a night elf ranger to play an RPG or anything, but precious few sim developers ever bother to leave crops behind, which is why I find Office Heroes so refreshing. Computers! Desks! Finally, a familiar setting! 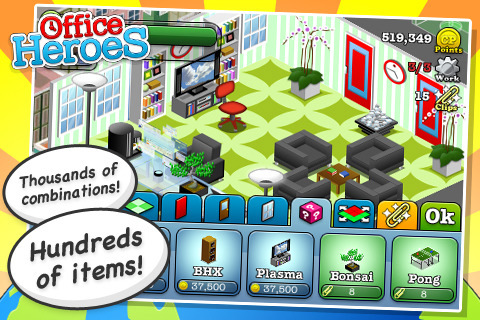 Actually, Office Heroes is way cuter than any office I’ve ever worked at, but you get my point. Just like with the Sims, it’s a surprising amount of fun to order around people who are “just like you”! And combined with the cute as a button cartoon graphics, that’s where the appeal of Office Heroes comes in. Like Farmville, Farm Story, and Zombie Farm, Office Heroes has you doing mundane tasks that are mostly just waiting, but in this case, it’s normal things you’d actually do, like checking email and creating Powerpoint presentations. Each task takes a certain amount of time and earns you career points, and just like forgetting to harvest your crops on time, you’ll be punished if you wait too long to check in on your little office drone. Career points are the primary currency of the game, and you also earn career points even when you’re not playing. Your “reputation” stats dictate how many career points you earn over time, so it’s worthwhile to keep those stats high if you want to have a lot of career points to spend. In my opinion, spending your rewards is the real fun part, because you can use your earnings to customize your appearance and office. I’ve never been all that excited to make a really cool looking farm, but decking out my office in the way I’ve always wished it could look? That’s got a lot more appeal. As with most freemium sim games, there are special currency you can purchase separately and use them to get nifty things in-game, but there’s also plenty of stuff you can get without spending a dime on the game. Now, like any Farmville-type sim, it’s not especially original, and there’s not a whole lot you actually do, but it’s a cute diversion. One especially nice feature included in Office Heroes is the ability to play without Facebook, which means you can indulge your mindless sim habits without irritating your friends with constant updates. Is it a great game? Of course not, but it’s definitely addicting to the right kind of person, and the production values for Office Heroes are sky high. Plus, it’s free, so if you’re getting bored of Farm Story and We Rule, why not check it out? 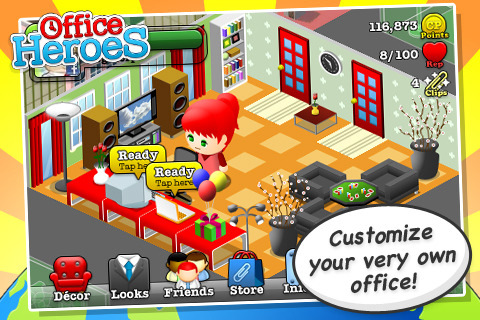 AppSafari review of Office Heroes was written by Tracy Yonemoto on September 7th, 2010 and categorized under App Store, Free, Games, Resource Management, Strategy, Time Management. Page viewed 4529 times, 1 so far today. Need help on using these apps? Please read the Help Page.